That's chilling as in cold, not chilling as in taking it easy. Despite heading a good distance closer to the Equator, Rome was much more wintery than the benign climate we have been enjoying on the Cote D'Azur. With only four days and a long list of sites to see, we wrapped up as best we could and set out from our windowless prison cell-like hostel room to explore along the cobbled streets. Making our way through the city seranaded by the seemingly ever present ambulance and police sirens, beautiful old churches and monuments seemed to appear at just about every other turn. Perhaps more amazingly almost none of them were covered in scaffolding like they were last time I was here. First stop was the Colosseum and Roman Forum. 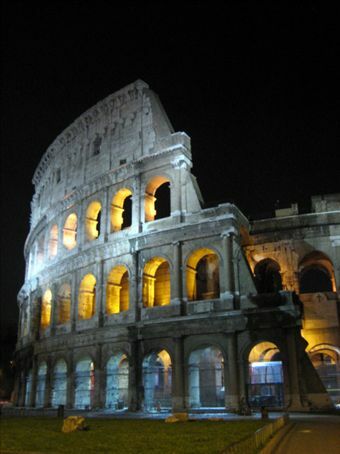 The Colosseum is an awesome structure and it is easy to imagine what it was like in its heyday with wild animals, gladiators, Christians and ships being dispatched left, right and centre to the roars of the 50,000 plus crowd. Impressive for a different reason and in much better condition was the Pantheon, the massive circular temple in the centre of town that at 47 metres across remained the largest concrete dome in the world for almost 1800 years. Unfortunately the sands of time have meant that a serious amount of imagination is required to bring the Forum and many of the other Roman remains to life. Of course no trip to Rome would be complete without a visit to the sites of the smallest country in the world. Like good tourists, we lined up with the hordes to see the Sistine Chapel and Vatican Museums. It was well worth the wait though. Considering Michaelangelo rated himself a sculpter first and foremost, he did a pretty amazing effort with a paint brush too. Almost as good as the Sistine Chapel was having nearly all the galleries filled with original Greek, Roman and baroque marble sculptures to ourselves, as everyone else just steamed past the door en route to the Sistine Chapel. That said, easily the best sculptures we saw in Rome, and for me the highlight of the city, were at the Galleria Borghese. Apollo and Daphne, Pluto and Proserpina, and a very dynamic representation of David, all by Gian Lorenzo Bernini are unbelievably expressive and life like. It goes without saying that in Italy, the food is as much a part of the experience as the sites. It is hard to beat fresh bruscetta, the tasty simple pastas and pizzas, the gelato (yeah we know it was winter but they were really good :), the coffee and freshly squeezed orange juice.